We’ve added a new feature to our website during our recent refresh that we're very excited about: the WCA Instant Proforma. The only input required to generate a five-year proforma is a hospital name or location. Give it a try: you can find it on our services page, and the results will look something like this. Let’s talk about it! Why did you guys build this thing? There is a certain amount of mysticism in the wound care industry surrounding the performance of wound centers and hyperbaric medicine programs. We hope to provide some clarity as to what a hospital can reasonably expect out of a program and what’s required to get there. A big takeaway from the Instant Proforma results should be that running a profitable wound center is hard. Without enough volume (~150 visits each month), it will be exceedingly difficult to generate any net income from a program. Even programs with high volume may find the income numbers to be underwhelming compared to numbers from 5 or 10 years earlier; this is a direct result of the changes in reimbursement and regulatory pressure being exerted on the industry. If a management company or consultant is presenting a financial picture that seems too good to be true, it probably is. Of course, there are benefits to opening or continuing to operate a wound care program even if it runs at a loss: spin-off revenue, patient retention, improved care and quality of life for patients. But these benefits should be considered on their own merits, without being colored by unrealistic financial projections. What kind of devilry is this? What factors go into the numbers? The two key factors in the Instant Proforma are the primary service area population and estimated market share. We ran a multivariable regression analysis on three years of WCA proformas and identified three key predictive variables that we use to estimate the PSA. A separate analysis was performed for sole community hospitals and rural referral centers. There is some sensible error checking to address edge cases, and a slider is available to make adjustments if the value is off the mark. Market share defaults to 12% and includes a slider as well. 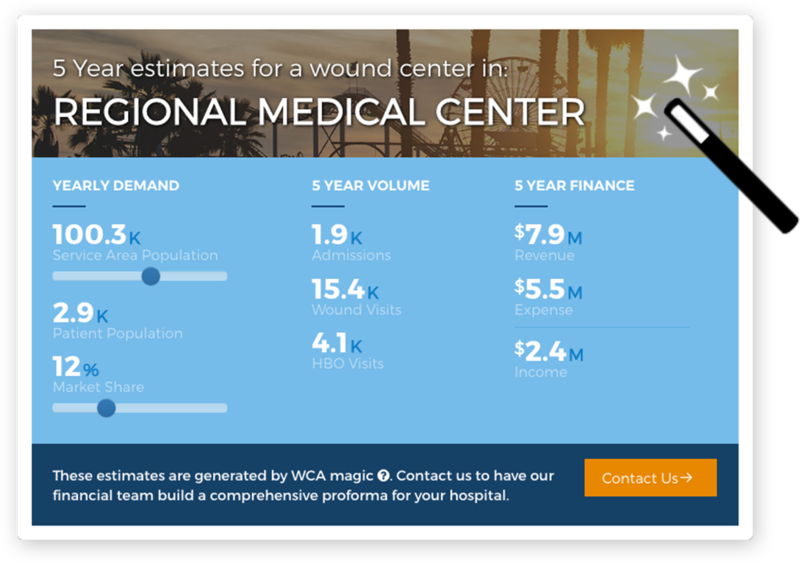 With these values established, the WCA Instant Proforma calculates patient numbers based on local area demographics and visit numbers using our corporate averages. Expenses include supplies, fees, maintenance and overhead, and salary estimates, with adjustments calculated based on volume. Revenue and salaries include an adjustment for the local wage index factor. Five-year totals are calculated using a conservative annual growth rate. What if I want to adjust something else? Sorry, the Instant Proforma doesn’t allow for changing anything other than PSA population and market share. First, we designed the application to be as simple as possible while still returning something useful. Second, we fixed many of the variables to represent the performance that WCA expects for a program. The valid ranges for those variables are not particularly large, and changing them could very easily skew the numbers and return unrealistic results. Finally, there simply are not many variables at a well-run wound care program that staff or management can make enough of an impact on to really move the needle. Market share, however, is a notable exception: a 1% increase may account for hundreds of thousands of dollars in income in the larger service areas, underscoring the importance of consistent community outreach and education. For most hospitals, when using default values for service area population and market share, the numbers are pretty good. Our objective is to be within a 25% margin of error of the “real” proformas using only the defaults, and we estimate that over 75% of facilities fall in that range. The options to manually adjust both population and market share bring the difference between the Instant Proforma and complete proforma values to well under 10%. Of course, the latter provides far more detail and room for customization. Also, be aware that the Instant Proforma does not account for some of the more esoteric wrinkles in the healthcare system. For example, it won’t run different calculations for hospitals in Maryland that operate under a capitation model. I put my hospital in there. Now what? Hopefully the resulting numbers are at least interesting and the Instant Proforma becomes a starting point for a discussion. Whether the numbers look good, bad, ugly, or nonsensical, our team would welcome the chance to talk with you about it, and we can work up a complete proforma that’s specific to your facility. Call us at 888.484.3922 or email info@thewca.com. Bonus question: Do the images change based on the location, too? Yes they do! Neat, right?